Oftentimes companies find it necessary to upgrade ColdFusion from an older version like 7, 8, 9 or 10 to version 11 or even 2016. During this process you may encounter problems or bugs, possibly some incompatibilities. We can help! WRIS Web Services has close to 20 years of ColdFusion experience and more recently specific practice with the migration process and can assist remotely with the upgrade of ColdFusion and the testing of your ColdFusion application afterwards. See Client Examples. Our US-based, Senior ColdFusion Engineers will install or can assist with the install of the desired new version of ColdFusion in a testing environment of your choice. We can also supply the test environment if needed. A copy of your application is migrated from the current (older) version of ColdFusion Server to the testing environment containing the new version of ColdFusion Server. Thorough testing is performed in the new environment to ensure the absence of errors or problems. Errors or problems that are encountered are resolved and tested again. Following our testing we ask that you, the client, perform your own testing. You know your application the best and can quickly observe any inconsistencies. Based on your feedback we go back in and fix or update anything else that is needed. Once the testing environment is determined to be solid, the next step is to migrate your application into your production environment. This process can follow a number of different paths, all of which we are comfortable explaining and performing. Please call 888-353-9971 for help today or click the banner to submit your request. 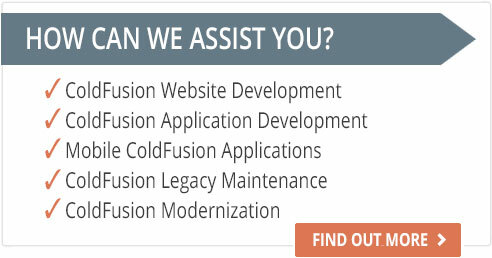 See our blog article on the ColdFusion Upgrade process.